Home Is There Value in a Customized UKA Implant? Is There Value in a Customized UKA Implant? As the number of unicompartmental knee arthroplasty (UKA) procedures performed in the US has increased, surgeons have been looking for ways to improve outcomes, particularly with regard to the kinematics of the knee. A customized, individually made UKA implant that was introduced in the market a few years ago reportedly reproduces the patient’s J-curve, which is intended to improve patient satisfaction and functional outcomes. However, because data on clinical and functional outcomes were scarce, surgeons from 8 centers across the country undertook a study to evaluate clinical and patient-reported outcomes with this implant. They implanted the device in 118 patients (120 knees) with osteoarthritis of the medial or lateral compartment. At 6 months, 1 year, and 2 years after surgery, they assessed functional outcome scores (KSS and WOMAC), range of motion, and patient satisfaction – including satisfaction with the naturalness of the knee’s movement. The surgeons found promising results, with improved range of motion, higher functional outcome scores, and lower pain scores. Patient satisfaction was high, with 99% of patients saying they were satisfied –89% were very or extremely satisfied with the results of the procedure and 89% said the movement of the knee felt natural. At 2 years after surgery, only 2 patients had undergone revision for tibial loosening. 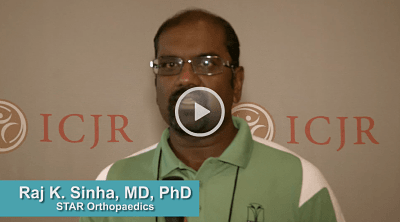 Raj K. Sinha, MD, PhD, from STAR Orthopedics in La Quinta, California, participated in the study, and he spoke with us about the implications of these findings. Barnes CL, Burdkhardt J, Sinha, RK, Martin G, Dauphine R, Mack D. Customized, Individually Made Unicondylar Knee Replacement: A Prospective, Multicenter Study of 2-Year Clinical Outcomes. Presented at the 2nd Annual Pan Pacific Orthopaedic Congress, July 22-25, 2015, Kona, Hawaii.